Bali is a popular destination for yogis, probably due to the nature of the place having naturally beautiful beaches, padi fields and cliffs and the development of the island being resort like and westernized. Perhaps the demographic of having 83.5% Hindu (Bali is the only place in Indonesia where Hinduism is predominant) contributes to making Bali ideal for yoga retreats. 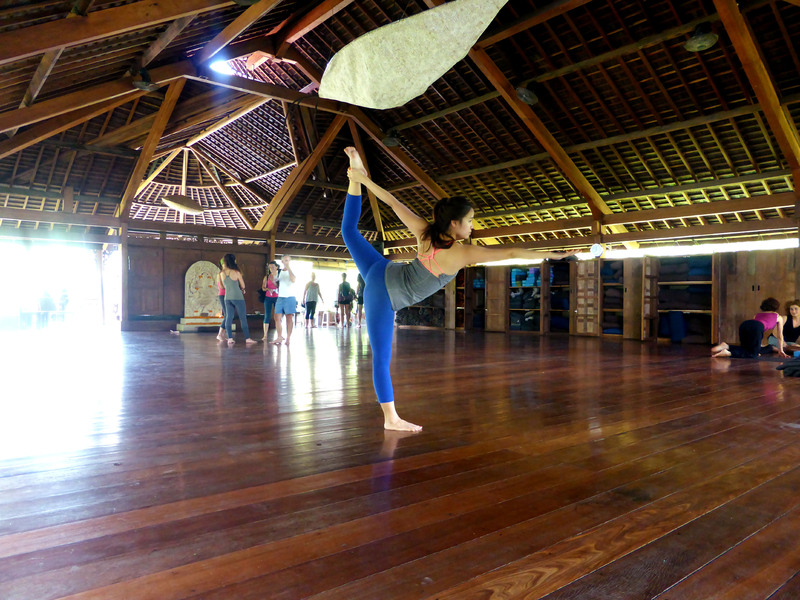 Often yoga retreats are hosted here with guest teachers but boutique studios are less common however, with only a few around. 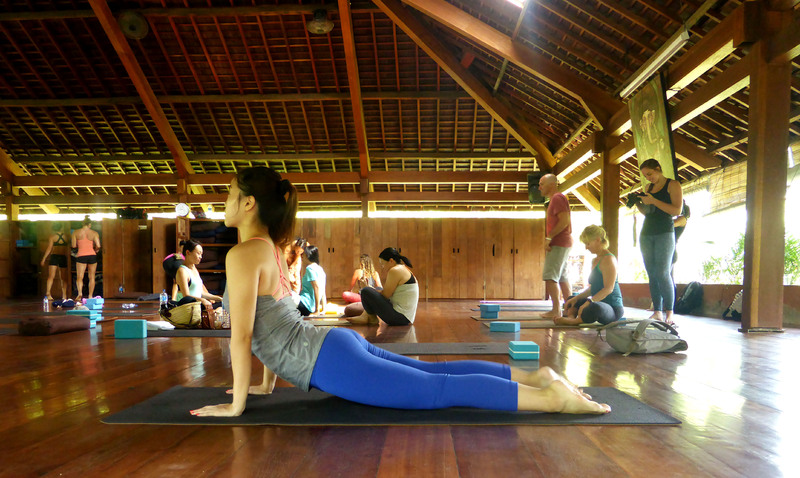 Yoga Barn is a popular and perhaps the biggest one, located in Ubud. The teachers here are mostly foreign. The location is quite hidden from the main road and you have to be sharp eyed to spot a hidden path (not accessible by cars but motocycles can squeeze through) to access the Yoga Barn. I missed the entrance to the path a couple of times before finally finding it. The exclusivity makes it special already. It’s actually located really near Bebek Bengil (a.k.a Dirty Duck) restaurant. Besides yoga classes, they also have an in house restaurant serving healthy food, including vegan or raw options. Of course you can find healthy juices and coconuts too. The premises is very big and it feels like a bubble of it’s own, exuding a very different vibe from the streets outside. They have 5 studios and the one featured above is the Nyoman studio. It’s located right above the main yoga reception and I suppose it’s the biggest one. This studio is non air-conditioned and full of natural ventilation due to the absence of windows. It’s basically very open and you can expect lizards and insects crawling across the ceiling. It doesn’t bother me because this is nature. Bali’s climate can be scorching hot when you’re in the sun, but in shaded areas and close to nature, the ambient temperature is actually really comfortable. The humidity isn’t that bad. In fact, I slept without air conditioning every night in my hotel room because the natural temperature (23 – 25 deg C) was perfect for me. Mats, water (and cups), and props are provided, though I must say the mats are of pretty poor quality. You are expected to wipe your mat before and after use for personal hygiene. Of course, you can choose to bring your own mat. My hotel in Bali actually provided yoga mats and it looked better than the one at Yoga Barn, which was of PVC material and peeling at both ends. Towels were not given and I didn’t ask about it either. I brought my own face towel anyway. Showers are provided but you probably need your own toiletries. Honestly, it is unnecessary to shower because the classes here are non-hot so you won’t end up dripping and when you step out into the Balinese sun once again, you’ll perspire like you do in the yoga class. No difference. I did a 10am Vinyasa Flow level 2 class with Emily and though it didn’t feel as challenging as Flow classes I do at Hom Yoga Singapore, I did enjoy my 90 minutes. Music was played in the background and together with the lovely ambiance, I felt very present and peaceful throughout my practice. I would say the level is easily approachable to those relatively new to yoga and I can imagine that level 1 flow classes are even easier. The class was well paced and the flow was natural. It’s one of my favourite yoga experiences so far! The price for 1 class is 120.000 rupiah, but I managed to find an Ubud tourist map which comes with a 10% off coupon for newcomers. I suppose this map is available at any tourist information counters, in hotels, some restaurants or the airport. The class worked out to be around SG$11.20 and it’s a very reasonable price for such a wonderful experience! Most of the participants are foreigners and tourists. If you happen to be around for an extended period, they do offer packages like 20 classes for 1.200.000 rupiah so that makes each class half the price of drop in rates (SG$6.25). This would be good if you’re in Bali for at least 2 weeks.